The Beretta M9: Still Relevant In The 21st Century? Home The Beretta M9: Still Relevant In The 21st Century? Now that the Beretta M9 9mm service pistol is in the process of being phased out in favor of the SIG Sauer M17 pistol (AKA the P320) one can’t help but ask: does the Beretta M9/92 pistol in general still have a place in the 21st Century? The Beretta is indeed an aged pistol. It’s an aluminum framed, double action single action auto in an era where polymer framed striker fired pistols rule the roost. And the fact that the military has decided to part ways with the M9 may seem like an ominous sign to many that the time of the Beretta 92 is sunsetting. 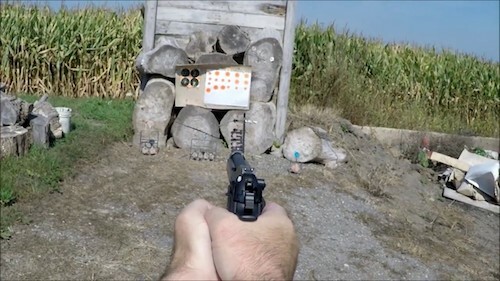 But here’s the truth: the Beretta M9 is not a bad pistol. On the contrary, it’s just the opposite! And just because the DA/SA metal pistol may be out of fashion with a lot of folks doesn’t mean it has to be for you as well. 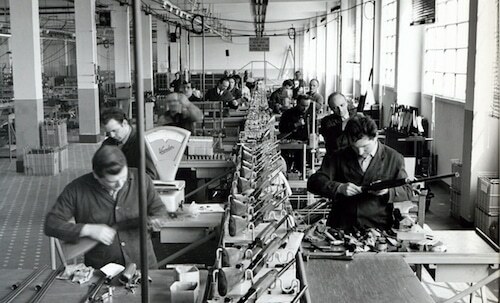 Here’s a fun fact: Beretta is the oldest firearms manufacturer still making guns today. Originally located in Val Trompia, an iron mine located in Italy, the first documented transaction from Beretta was in 1526. Over a hundred years later, Beretta was the second largest manufacturer of gun barrels in the world, supplying arms to countries all across the globe. Today, Beretta has maintained its status as one of the premier gun manufacturers, producing a variety of pistols, shotguns, and rifles. But it’s their 92/M9 pistol that the company is without question the most well known for. In fact, many of those who are not even into guns can look at a 92 and identify it simply as a “Beretta” by what they’ve seen in movies and video games. How did the 92 develop? Long story short, Beretta took their M1951 pistol, combined it with the proven DA/SA design of the Walther P38, gave it a double stack magazine, and the original Beretta 92 was born in 1976. It combined the open slide, grip angle, and basic look of the M1951, the DA/SA design of the P38, and the locking blocks from both pistols. The original 92 featured a frame mounted safety and a heel magazine safety. This was later updated into the 92S, which transferred the safety to the slide and also made it decock the pistol when it was engaged. Subsequently, the 92S and almost all subsequent models of the 92 series cannot be carried cocked and locked. 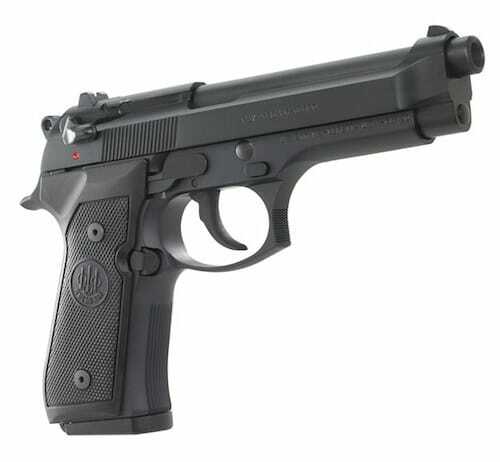 The 92S saw great success with European law enforcement and militaries, and later evolved into the Beretta 92SB, which was designed for the United States military trials. The 92SB featured an ambidextrous slide mounted safety, three dot sights, and most importantly relocated the magazine release from the heel of the grip to behind the trigger guard for faster reloading. 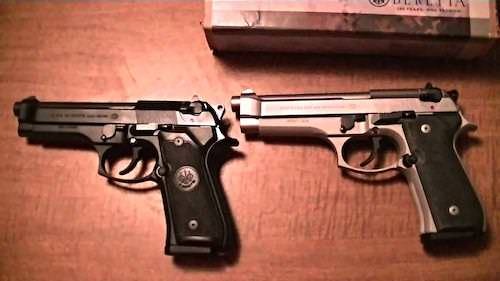 The 92SB then evolved into the 92F, which most notably squared the front trigger guard and was finished with Beretta’s famed Bruniton finish for better corrosion and moisture resistance (previous Beretta pistols had a blued finish, which is significantly less resistant to corrosion and moisture). The 92FS of today is basically a 92F with an enlarged hammer pin, which was done to reduce the chances of the slide flying off the weapon in the event that it cracks. Meanwhile, the Beretta M9, the standard sidearm of the US. military since 1985 and also sold on the civilian market, is essentially a 92FS with only a few minor changes, which we’ll talk about next. Contrary to what many people think, the Beretta M9 and 92FS are not the exact same pistol. Yes, they are almost identical, but there are still a few small differences. Besides the markings (the most obvious difference), the biggest difference between the two pistols visually is the frame. Since around 2005, the 92FS has used a slightly slanted/angled dust cover in front of the trigger guard whereas the dust cover of the M9 is flat. This was originally done to strengthen the frame of the Beretta 96 .40 caliber, and Beretta decided to do the same with the 92FS as well. But the M9 maintains the flat cover like the 92FS used to. The second biggest difference between the two weapons is the sights. The 92FS has a three dot sight system, whereas the M9 has a two dot system instead (which many actually prefer since it can be easier to line up the sights). The 92FS also has a radiused back strap, which the M9 lacks. The M9 pistol is known for being large and heavy for a 9mm. It’s for this reason that many people aren’t exactly fans of packing the weapon on their hip all day, let alone conceal carry it (even though it can definitely be done). Nonetheless, this extra weight of the M9 is also one of its best assets: it tames recoil and reduces muzzle flip, allowing for faster follow up shots especially in single action mode. Furthermore, the M9 utilizes a fixed barrel design, in contrast to the tilting barrel like we see on most pistols today. This feature, combined with the added weight, makes the Beretta M9 a very accurate firearm that is surprisingly easy to shoot for its large size and bulk. The Beretta M9 is also well known for its reliability. While soldiers serving in Iraq and Afghanistan did encounter some reliability issues, most of those issues were based on the cheap Checkmate magazines that the government purchased for a lower price. The problem is those magazines ended up fairing quite poorly in the sand of the Middle East. Fortunately, with standard 15 or 17 round factory magazines, or with the 15 or 18 round magazines offered from Mec-Gar, the M9 functions fine. The military later replaced the magazines with PVD coated ones for the M9A1, which solved most of those issues. And that’s the other thing: the M9 holds a lot of bullets! As long you don’t live in a place where you are by law restricted to 10 rounds, you can buy magazines for the M9 that hold anywhere from 15 to 18 rounds for the flush fitting magazines and 20 to 30 rounds for magazines that extend beneath the grip. Magazines are also easy to find and are very reasonably priced. Another big advantage to the M9 is its wide availability of aftermarket support for it. Spare magazines, holsters, grips, hammers, sights, triggers, and additional spare parts and accessories are all very easy to find for the Beretta. No, the aftermarket support is not quite as extensive as say he Glock or the 1911, but it’s still impressive in its own right. Finally, the Beretta M9 can attest to something that few other handguns can: it’s battle proven. This pistol has seen combat repeatedly all over the world for decades, and it’s still being used today. Love the M9 or hate it, no one can deny that it’s a pistol that has been put through its paces. The first disadvantage of the M9 is its size and weight. While it reduces recoil and helps with accuracy (especially with the aid of that fixed barrel), it’s still not nearly as light as say a Glock 17, one of its primary competitors. The Achilles heel of the 92 series of pistols overall, and even diehard fans of the 92 will admit this, is the exposed locking blocks. If the locking blocks fail, the entire pistol fails, and that’s unavoidable. It is generally recommended that to avoid this, you replace the locking blocks every five thousand rounds. The M9 has a DA/SA operation, and the DA trigger mode is rather long and sloppy. The SA trigger is much shorter, though it still has some slop to it and is not exactly crisp. 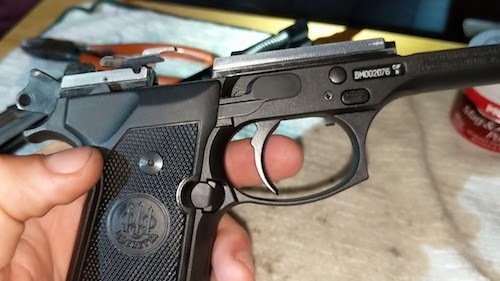 You can help remedy this by installing a lighter trigger spring, but still, the trigger of the Beretta M9 is nowhere close to the renowned triggers of the Walther PPQ or CZ P10C. 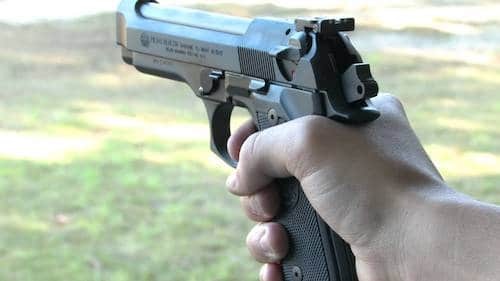 The grip of the M9 is also wide and large in comparison to other handguns, which means it won’t be the greatest option for shooters with smaller hands. 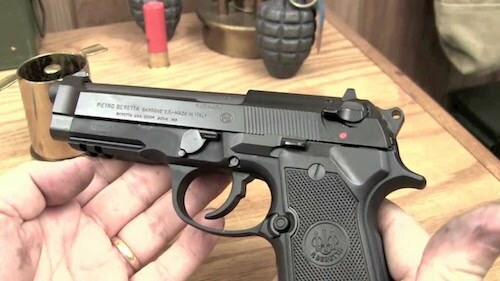 However, Beretta offers the M9A3, which features a narrower grip to accommodate more people. The M9 was intended by Beretta to be a general service pistol for military and law enforcement use, and it has excelled in that role, being the service pistol for countless militaries and police forces all across the world. In the hands of a civilian, the M9 can still be used for a variety of purposes. While it’s not the best option for a concealed carry piece, it can certainly be used for that role if you so choose to do so. The M9 is much too big to be carried in the pocket or an ankle holster, but OWB, IWB, or in a shoulder holster it would serve just fine. One of the best roles for the M9 will be as an SHTF weapon. As was discussed previously, the M9 is accurate, reliable, proven, and spare parts and accessories are widely available. All of these are qualities you would want in a sidearm for when things go bad. The M9 is also a good choice for a home defense pistol to keep on your nightstand. With an 18 or 20 round magazine from Mec-Gar loaded with 9mm JHP self-defense rounds, the M9 offers you plenty of firepower for an intruder. Firearms expert Massad Ayoob opinionated that the Beretta 92 pistol is one of the best pistols to keep on your nightstand and, at least at one time, personally used a customized Beretta for the role. Last but not least, you can also use the M9 as nothing more than a range piece if you would like as well. The accuracy, limited recoil, and larger size make it well suited for this task. Is the M9 still relevant in the 21st Century? Even though it’s large and heavy for its size, that doesn’t necessarily mean it’s an outdated firearm. When it comes down to it, the Beretta M9 is a fine example of a DA/SA 9mm service pistol. If a DA/SA hammer fired design is what you prefer over the various striker fired options, there’s no question that the Beretta M9 is one of your best options currently available.